Our eMagazine is available below or via the Issuu app on your iOS or Android device. The beautiful high-resolution spreads can be viewed at anytime and even offline with the Issuu app. Full versions of each eMagazine can be purchased via Issuu. When it comes to entertaining, this special issue kicks off the holidays in a beautiful way—filled with decorating and seasonal styling ideas, along with the best comforting, autumnal recipes, that are sure to inspire! A special introductory offer for loads of gardening inspiration & tips! I hope this Winter White Snippets magazine helps you to get into a fresh, bright Country House state of mind! 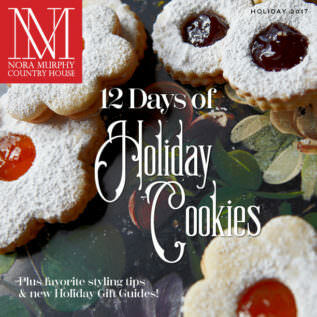 We’ve made this Holiday issue even more special by sharing my favorite holiday cookie recipes, styling tips, and creating a feast for the senses with our new Get The Look pages. Happy Holidays! The Delicious Art of Tomatoes. Like my garden, the latest issue of Nora Murphy Country House is full of my favorite late summer treat: fresh-picked tomatoes! Our new issue is filled with our favorite Summer entertaining, gardening and decorating ideas! In our latest issue, immerse yourself in the bounty of Spring flowers at Connecticut Country House. Be inspired to add color to your garden this spring. Whether your kitchen’s in a home from the 1700s, 1800s, 1900s, or beyond, it’s never too old—or too new!—for a Country House perspective. Let’s go Country House kitchen-hopping together. Take an Adirondack-inspired Country House tour! 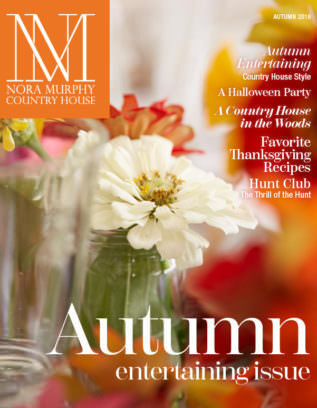 Nora Murphy Country House Style, Winter 2017 is filled with decorating, entertaining, and the most delicious (if we must say so ourselves!) Chili recipes! Our Holiday issue is filled with inspiration for decorating and celebrating the season.